Radioactivity is the phenomenon in which some elements discharge small particles known as radiation, to form the other element. This is in contrary to the accepted Dalton postulate of indestructibility of an atom. Though, only elements having unstable nuclei termed as radioactive are capable of undergoing the natural radioactivity whereas stable nuclei do not. All the elements having atomic number more than 83 are radioactive and they experience nuclear transmutation (that is, nuclear reaction) which differ considerably from ordinary chemical reactions. The knowledge of radioactivity has contributed vastly to medicine, industry, archeology, scientific research, engineering and agriculture. With the exception of hydrogen (11H), each and every atom of an element consists of a nucleus that comprises of neutrons and protons, having electrons occupying significant empty space around the nucleus. The nucleus is a minute fraction of net volume of atom, yet almost all the mass of an atom resides in the nucleus. Therefore, nuclei are extremely dense. It has been illustrated experimentally that nucleus of all the elements has around the similar density of 2.4 x 1014g/cm3. 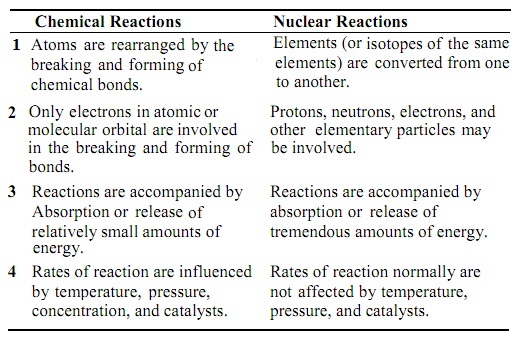 Table below illustrates the general properties of fundamental components of an element. The ratio of number of neutron to proton in any nucleus verifies the stability of the nucleus and as well affect nuclear reaction is termed as neutron-proton ratio. The neutron-proton ratio of an element states which if element will naturally undergoes the radioactivity or not. A) Nuclides having 'Magic number' (2, 8, 20, 28, 50, 126) of protons or a number of neutrons or a sum of the two have unusual stability. C) All the isotopes of the elements having atomic numbers higher than 83 are radioactive. 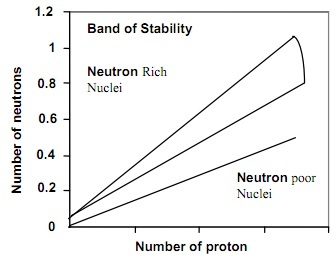 The figure below is a plot of the number of neutrons (N) versus number of protons (Z) for the stable nuclides (that is, the band of stability). For low atomic numbers, the most stable nuclides encompass equivalent numbers of protons and neutrons (N - Z). Above atomic number 20, the most stable nuclides encompass more neutrons as compare to protons. Careful examination reveals an about stepwise shape to the plot because of the stability of nuclides having even numbers of nucleons. a) The sum of the mass numbers of the reactants should be equivalent the sum of mass number of the products. b) The sum of atomic number of the reactions should be equivalent to the atomic number of the products, this keep charge balance. Some of the nuclei are unstable; therefore they emit sub-atomic particles or electromagnetic radiation in a phenomenon termed as radioactivity. Radioactivity can be of two kinds namely, natural and artificial radioactivity. Natural Radioactivity: This is a kind of radioactivity that takes place spontaneously, emitting electromagnetic radiation and particles that comprise beta, positron and alpha particles. The occurrence of this kind of decay or emission takes place, based on the position of nuclei whether above, below or sides of the stability/belt region. Most of the naturally radioactive nuclei lie outside this belt. Artificial radioactivity: This is a non-spontaneous form of radioactivity that needs effect of bombardment of the nuclei having sub-atomic particles. It is or else termed as anthropogenic or induced radioactivity. The nuclei in this area encompass a very high ratio of neutron to protons than those in the belt. To reduce this ratio and move down toward the belt of stability, they go through a nuclear reaction termed as Beta particle emission. The beta particle is an electron ejected from the nucleus whenever a neutron is transformed to a proton. The emission of Beta particle leads to an increase in the number of proton in the nucleus and a simultaneous reduce in the number of neutrons. The nuclei here encompass lower neutron-to-proton ratios than those in the band thus they require increasing this ratio and afterward moving up toward the belt of stability. The nuclei undergo two possible kinds of nuclear reaction; positron emission or electron capture (K capture). This is significant to note that some of the neutrons-poor nuclei, specifically the heavier ones, raise their neutron-to-proton ratios by undergoing alpha emission. The alpha particle is emitted from nucleus thus reducing the mass number by 4 and atomic number by 2. The gamma rays are high energy radiation, emitted whenever an unstable nucleus experiences a rearrangement of its constituent particle to provide more stable, lower energy nucleus. Gamma rays are often emitted all along with other kind of subatomic particles. It will be noted that pure gamma emitters are rare, however instead, the radiation gamma accompany either alpha or beta radiation.